Some time before Chinese New Year I received an email from a beauty parlor named Devonshire Selected Beauty Salons. Their request was simple - to offer their eyelash extension service to me. I was elated but to be honest, I felt a little hesitant at the same time. You see, I tried eyelash extensions before at a different salon but I wasn't satisfied with the results. I only liked it when a layer of mascara was applied over the extensions; which totally defeated the purpose. The reason why I decided to go ahead and try Devonshire's service is because I've been eyeing on Kim Kardashian's and Kylie Jenner's lashes for the longest time. No matter how much mascara I apply, I'll never be able to achieve the length or volume of their desirable lashes. Sticking on falsies can be pretty time consuming too! I mean it's always a dream of any girl to have full but natural looking eyelashes right? Hence, I paid a visit to Devonshire Selected Beauty Salons. This time, I came extra prepared. I knew exactly the type of lashes I wanted to walk out of the salon with. I had tons of photos of Kylie Jenner's lashes in my phone and was prepared to show my technician/eyelist what I wanted. Usually at such beauty parlours, your requests may get rejected due to aesthetic reasons. For example, your facial features or eye shape may not suit a particular style. But at Devonshire, you can be assured that you'll get whatever you want which instantly makes a customer satisfied and confident. But if you're unsure of you want and would rather seek professional advice, fret not! Leading eyelash extension technician, MOMO will be more than happy to help. MOMO Nishikori is a certified technician from Japan who has more than 7 years of experience in this field. She has been practicing such services and imparting the knowledge to others in Shibuya, Japan alongside her sister. Basically, upon arrival, MOMO will examine your lash hair quality; eye shape and face shape to determine which lash design would suit you better. But as mentioned earlier, you are always more than welcomed to propose the ideal style. 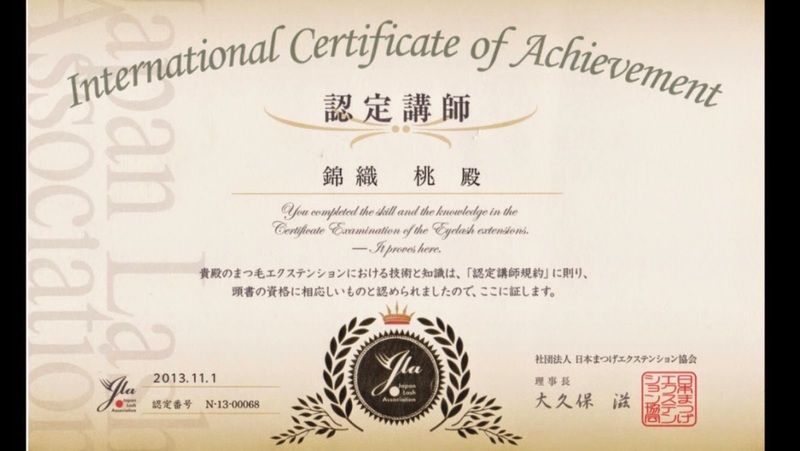 MOMO Nishikori, certified instructor by Japan Lash Association. There are various lengths and thickness of extensions to choose from but I suggest you make your money worthwhile and try the most voluminous one. hehehe. Once you've decided on the style that you want, you'll be ushered to your "treatment" bed. What I love about Devonshire Selected Beauty Salons so much is their classy and spa-like interior design. 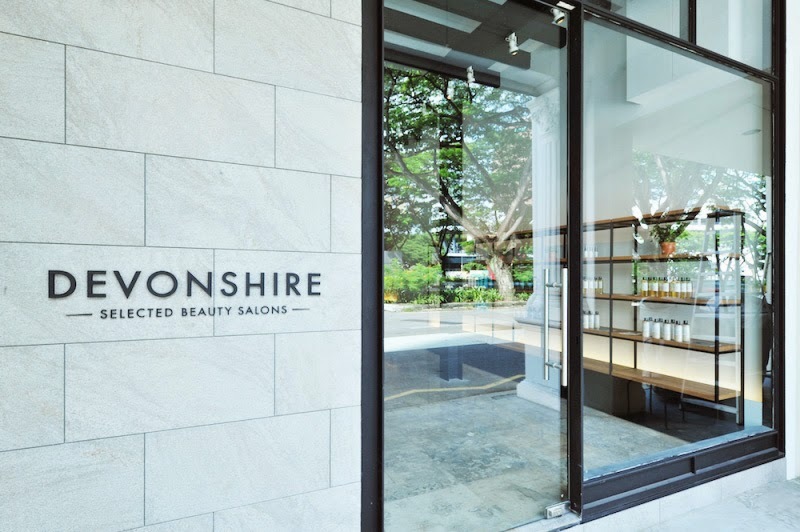 I've heard and come across a lot of other eyelash extension salons before and none of them have an ambience as tranquil as Devonshire's. Stepping into the salon seriously felt like stepping into a spa. 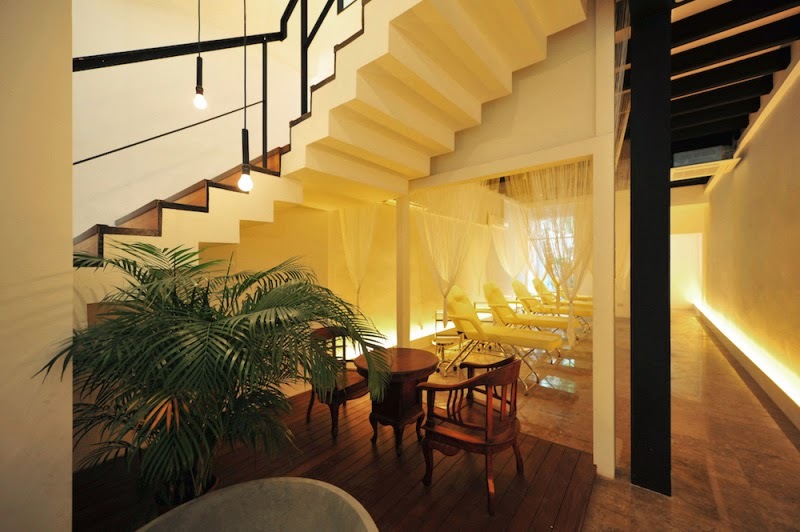 It had a calm and peaceful atmosphere that would immediately make you feel relaxed and rather, sleepy. hehehe. It's an experience above what I'm usually accustomed to and it's one of the main factors to why I highly recommend everyone to try Devonshire out. I've already visited the salon twice and these pictures are taken during my second visit. The first appointment was about 2 weeks before my second one and the lashes are still very well intact and in place as you can see from the pictures. I took extra care of my extensions unlike the previous time hence they managed to last pretty long. I guess what makes Devonshire's EyeDesign special and safe is that the glue and all of the extensions used are manufactured in Japan EyeDesign Factory. The glue in particular is made specifically for sensitive eyes hence it's very safe and gentle on our natural lashes. In order to prevent any irritation around the eye area, MOMO is trained to place the extensions 2mm away from the lash root. This also prevents damage to the natural lashes. 2 weeks after the first visit and my extensions are still pretty full and well intact. The entire procedure lasted for 1 hour which is extremely fast given that I woke up after with 120 extensions glued to my natural lashes. Yes, I fell asleep during both the first and second sessions. MOMO was exceptionally professional at it, she was calm, gentle and had a steady hand. I didn't feel any discomfort at all during the sessions which resulted in me falling asleep. hehehe. Their extensions are so comfortable; it doesn't obstruct my view or add weight onto my lids at all. Even though I asked for full and voluminous Kylie Jenner lashes, the extensions still feel soft and light. What I love most about them is how nicely they curl upwards; enlarging my eyes. I've seen how some extensions causes girls' eyes to appear smaller but Devonshire's don't do that at all! I have no regrets and I will definitely keep coming back for more. Frequently asked questions about eyelash extensions. 1. How long do the extensions last? Eyelash extensions are semi-permanent and will last up to two months if they're well taken care of. The extensions may fall as and when your natural lashes fall. It is normal for your natural lashes to fall due to the lash cycle. 2. Are eyelash extensions safe? If your extensions are applied by a trained and licensed eyelash extensionist/technician, it is completely safe and harmless. Always read reviews and do research on the salon you're planning to visit. 3. Will extensions damage my natural lashes? If they're done at a reputable and trustworthy salon that uses safe glue, you'll be fine. How they fair after depends on how well you take care of them. 4. Will I be able to apply make up on my eyes after? Yes, of course. You may apply eyeshadow, eyeliner and even non-waterproof mascara. Just make sure to use water-based make up remover after. Anything oil-based may weaken the glue resulting in lost of extensions. 5. How do I take care of my extensions? - Avoid pulling, picking or rubbing your lashes at all times. Even when it seems to be falling out, just leave it to fall naturally. Never ever pull an extension out because you may be pulling your natural lash out at the same time. - Avoid contact with water 6-7 hours after application. - Do not use oil based make up remover or cleansers. - Never ever curl your extensions as that might break both the extensions and your natural lashes. - Occasional short visits to sauna or steam room is fine but prolong usage may cause the glue/adhesive to weaken resulting in lost of extensions. - If your extensions get tangled, gently brush it with a mascara wand. 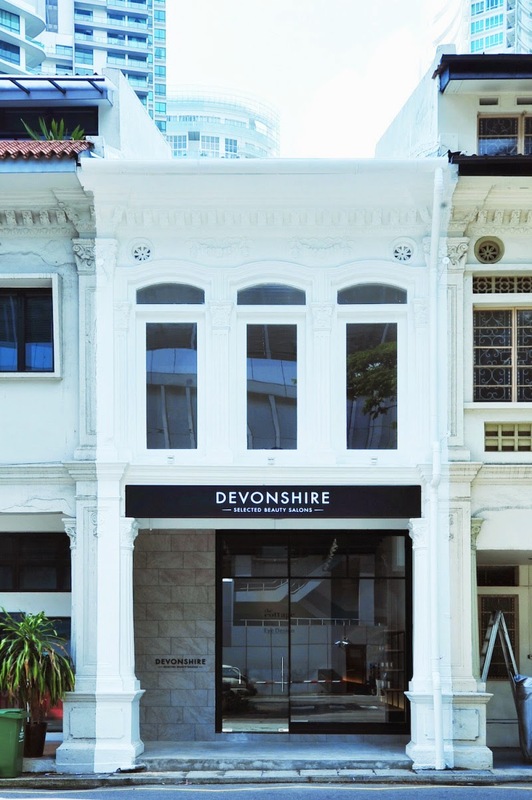 For more information, head over to https://www.facebook.com/devonshire.sg! Call 6334 7898 for enquires or to book an appointment. Prices vary according to length and quantity of lash extensions. Thank you for this blog many people agree with your blog and i also get many information about the Eyelash Extension Training nice work. I have been reading your posts regularly which is specially for affordable eyelash extension and I need to say that you are doing a fantastic work. Please keep it up the great work. Going to use eyelash extension to enhance your eye's beauty? You should know all about eyelash extensions Vancouver. look no farther, Gold Lash Bar is here. Buy careprost from nestpillmart used to have longer eyelashes growth. I know this post is almost a year old so hopefully you’ll still respond haha! I just got mine tinted and lifted; i also had that burning sensation! I was wondering if your eyelids had any lil red veins show up? And im really hoping after a few days its jusy from being irritated and will go away. I want to know more about about eyelash extension training canada and How to score a more natural eyelash-extension look. careprost bimatoprost ophthalmic solution to treat open angle glaucoma. if you are looking for the best salon in jaipur then go for the sizzlin scizzors, because they give you the best makeover. Are you looking for a eyelash extensions online store in USA? then visit Narcissistic Creations. The store offering natural lashes extensions, mink lash extensions, eyelash extensions miami and much more. 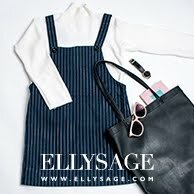 Your blog is fulled with great contents. Nice Post. Iam following your blog regularly nice content very useful information thank you. Kolors Weight Loss Clinic will help you Reduce Weight with Best Weight Loss Programs , Best Hair Loss and Skin Care Treatments in Chennai, Hyderabad, Pune, Indore and Bangalore locations. Your blog is fulled with great contents. Nice Post. really i like it thansk for this Your blog is fulled with great contents. Nice Post.